Ever since the 1880s fruit growers of the Hills District had sought a rail link from Parramatta north to Baulkham Hills, Castle Hill and on to Dural. 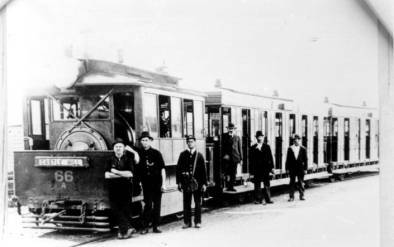 In 1881 and 1884 deputations urged the Minister of Public Works to build a light railway to replace the slow horse-drawn transport which travelled on inadequate roads leading to the main railway stations at Thornleigh, Hornsby, or Pennant Hills in the north, or Seven Hills and Parramatta in the south. In 1887, a survey was commenced for a railway link from Westmead, Parramatta and Rosehill to Dural but the Commissioners stated in March 1889 that interest payments on the capital to be borrowed would not be met. However, Bennett's private railway was constructed from Clyde Station to Rosehill in 1888 and this was to have a bearing on the Hills District. After investigations in 1891 and 1892 by the Minister for Works on the state of roads in the fruit growing district the Simpsons's Railway Act was passed on 13 June 1893 authorising the private construction of a railway line in three sections from Bennett's Railway line to Dural. The first section was to terminate at Carlingford, the second at Castle Hill (Rogans Hill) and the third at Dural. The Carlingford line was opened on 16 April 1896 but due to the increased costs and poor return from the freight and passenger service, it was decided not to proceed with the remaining sections. By the end of 1896, both Bennett's and Simspson's railways were in the hands of the Bank of New Zealand. Proposals for the extension of the Carlingford line and for the construction of a tramway or light railway from Parramatta to Baulkham Hills, Castle Hill and Dural were again put forward. The Government's decision to construct a steam tramway from Parramatta to Baulkham Hills put an end to any extension of the Carlingford line, which the Government had bought for 22,500 pounds shortly after June 1899. The Government service to Carlingford commenced on 1 August 1901 and local residents often referred to it as the "Apricot Express". Once fruit growers realised that they were not going to get a railway service to Dural they formed a co-operative society known as Central Cumberland Co-operative Tramway and Fruit Packing Limited. Their idea was to construct and operate a horse tramway from Castle Hill to the Park Gates, Parramatta, via Windsor Road and O'Connell Street, then link up with the Park Gates to the Redbank Wharf steam tram, which had operated down George Street since October 1883. Their fruit would then travel by boat to the Sydney Markets. This meant that they would no longer be using Government Railways. The thought of losing this trade, and possibly passengers as well, caused the Government much concern and they announced that a Government owned tramway would be built from Parramatta Station to Baulkham Hills. In 1900 the final survey of the tramway line was carried out and construction commenced in March 1901. 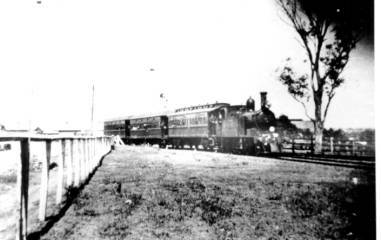 The line was opened to Baulkham Hills on 18 August 1902. It had a standard gauge of four feet eight and a half inches and came off the western railway line at Parramatta, running down Argyle Street and under the railway bridge into Church Street. At the Darling Mills Creek a separate bridge was built and the line continued on the western side of Windsor Road to Baulkham Hills where it rounded the corner from Windsor Road into Old Northern Road, terminating opposite Suttor Park - a distance of 4 miles 38 chains. The Depot consisted of sheds to accommodate four motors and eight cars, and a goods siding. This is now the site of The Hills District Bowling Club. An extension of the line to Castle Hill began during 1909 and was opened on 1 Aug 1910 at a cost of 13, 142 pounds 17 shillings and 2 pence. Two trams now operated an hourly service between Parramatta and Castle Hill with an extra run in peak periods. These trams were based at Baulkham Hills Depot where a turntable had been installed to enable trams to be turned to give equal wear on wheel flanges. From 1910 the tramway transported goods traffic in flat ballast bogie vehicles while letters could be posted in a letterbox installed on the rear apron of the last car. Stopping places were signposted and trams stopped regularly but beyond Baulkham Hills they stopped where required. From 1912 additional journeys were operated during peak hours between Parramatta and the Woollen Mills alternating with the hourly service to Castle Hill, giving a half-hourly service to Northmead. Thefruit growers were not the only group to benefit from the tramway. The Woollen Mills situated at Darling Mills Creek found the direct line to Parramatta and thence to Sydney a major commercial advantage. Passenger traffic also increased and this coincided with a greatly accelerated rate of subdivision of old estates in the areas adjacent to the tramway. In many cases auctioneers and real estate agents promoted the proximity of land to the tram system, as evidenced in subdivision maps of the period. The Railway Department had been unhappy with the idea of a tramway carrying goods traffic and by the early 1920s it was being asked to provide a better facility as the tramway was unable to meet the demand for freight. It took the easy way out by converting the tramway to a light road-side railway which included a lengthy deviation via Westmead so as to avoid running through the main streets of Parramatta, although a greatly truncated tram service was retained for this section. In 1920 work commenced on the railway connection from Westmead to the Woollen Mills and was completed on 27 October 1921. The line, which was laid in sixty pound rail, curved away from the main western line near the Westmead Boys Home and crossed the Old Windsor Road. It then bridged Toongabbie Creek by means of a steel viaduct, built from recovered materials, and continued adjacent to Briens Road until it reached Northmead platform which was located near Briens and Windsor Roads. The conversion of the Woollen Mills-Castle Hill tramway to railway standards was commenced in February 1922. From Northmead platform, Windsor Road was regraded up past Hammers Road and also between Model Farms and Junction Roads using picks, shovels, and a horse and dray. At Baulkham Hills, the line veered across Windsor Road and entered the paddock in which Baulkham Hills Library is now located, crossed Railway Street, then went through a cutting to reach Baulkham Hills station and goods yard, now The Hills District Bowling Club and Suttor Park. The station had a platform 70 feet long, a booking office, shed and goods loop which held 7 trucks and was the only station where tickets were sold otherwise tickets were purchased from the junior porter on the train. At Castle Hill there was a platform, passing loop and goods siding to accommodate 13 trucks. It was located in what is now Arthur Whitling Castle Hill Park. The line was opened for traffic on 28 January 1923 and the extension to Rogans Hill was opened on 24 November 1924. 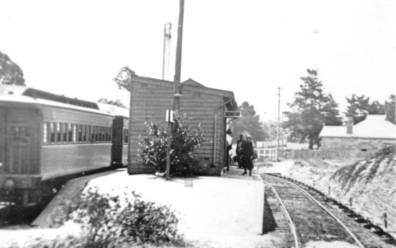 Platforms or halts along the railway line from Westmead Junction were Mons Road, Northmead, Moxhams Road, Model Farms Road, Junction Road, Baulkham Hills, Cross Street, Southleigh (renamed Excelsior Avenue in 1923), Parsonage Lane (opened in December 1923), Castle Hill and Rogans Hill. CastleRidge Retirement Village is the site where the Rogans Hill goods yard was located. The train was called "Pansy" and it usually consisted of three cars. In October 1924 a second train was timetabled. But the railway was doomed to failure owing mainly to the development of the internal combustion engine. Motor trucks were far more convenient for moving produce to market and the motor bus of the day was faster, more efficient, more frequent, and cheaper for carrying locals to work, school, recreation and shops, especially Church Street, the main business centre of Parramatta where the train did not travel. From 1926, road motor traffic increased considerably along the route. As the railway only left about 28 feet for the roadway, after a footpath had been provided, the Main Roads Board suggested, on 28 May 1928, to either relocate the railway on a new route or resume land to widen Windsor Road. As this was very costly, and the line was averaging about a 25,000 pounds loss per year, it was recommended to close the line on 30 June 1930. The financial loss was also connected to problems in the fruit growing industry such as the advent of fruit growing in the Gosford district and the Murrumbidgee Irrigation Area, and a fruit fly infestation resulting in New Zealand placing an embargo on NSW fruit. To save money, the steam train known as "Pansy" was used for the transport of fruit and goods overnight and for passengers in the peak morning and evening periods. A rail motor named the "Tin Hare" was used for passenger traffic between 9am and 4pm when the average number of passengers was only 260 and half of these were school children. The line continued in service until 31 January 1932. It was not until June 1934 that all tracks and other signs of the railway had disappeared. Various suggestions to reintroduce some form of rail transport have been made in recent years. In 1999 the State Government proposed an initiative to build a rail link from Parramatta through Carlingford and Epping to Chatswood by 2006, and another from Epping to Castle Hill by 2010, with a later extension to Rouse Hill likely.